Eleven’s journey in the next season of Stranger Things has been largely kept a mystery, following her cliffhanger disappearance at the end of the first season. But a new clip gives a little taste of how she escaped her trip to the Upside Down, and it’s definitely not pretty. MCM Comic Con London has released a new clip for the upcoming season of Stranger Things. 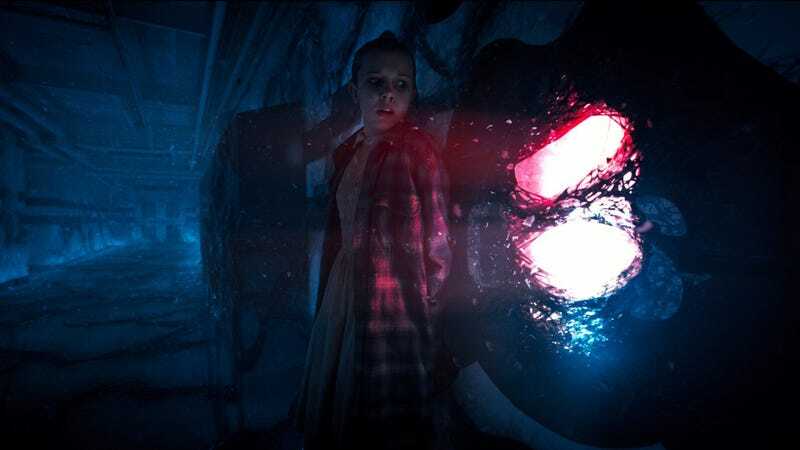 In the short video, Millie Bobby Brown introduced a scene from the next season, showing Eleven escaping the Upside Down at the high school, using her powers to break down both the physical wall and the ooey gooey substance that separates our world from the Upside Down version. What results is Eleven emerging from the womb of the Hawkins High School tiger’s paw. It’s unclear whether this scene takes place shortly after Eleven disappeared into the Upside Down (since her head is still bald), or if time moves differently in the icky sticky place. But it seems far more likely that it’s the former, given how her new hair length looks to match a year’s worth of growth. You can watch the new clip below. Stranger Things returns October 27.